2. Haffajee AD., Cugini MA., Dibart S., Smith C., Kent RL., Socransky SS. 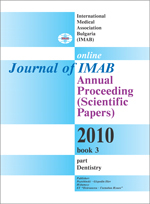 The effect of SRP on the clinical and microbio­logical parameters of periodontal disease. J Clin Periodontol 1997; 24: 324- 334. 3. Haffajee AD., Socransky SS., Feres M., Himenez-Fyvie LA. Plaque microbiology in health and disease. In: Newman HS. Wilson M. Dental plaque revised: oral biofilms in health and diseases. Cardiff school of biosciences, 1999: 255-282. 6. Popova Chr., K. Kotsilkov. Effectiveness of the additional antimicrobial treatment in comparison with mechanical cause-related therapy of chronic periodontitis. Zabolekarski pregled 1/2007 70,71p. 7. Slots J. Bacterial specifity in adult periodontitis. J Clin Periodontol 1986; 13: 912-917. 12. Yano-Higuchi K., Takamatsu N., He T., Umeda M., Ishikawa I. Prevalence of Bacteroides forsytus, Porphyromonas gingivalis and Actinobacillus actino­mycetemcomitans in subgingival microflora of Japanese patients with adult and rapidly progressive periodontitis. J Clin Periodontol 2000; 27: 597- 602.